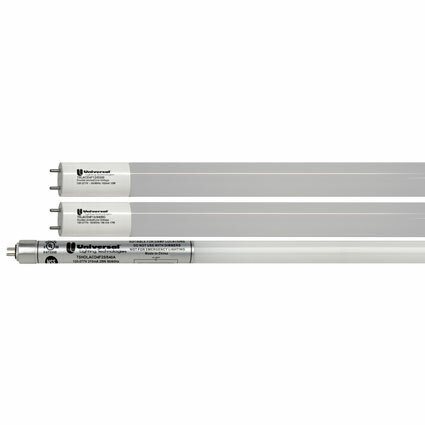 Universal’s AC Direct LED Linear Tubes are ideal for T8 and T5 fluorescent lamp replacement – connecting directly to line voltage for easy installation and are offered in Standard or Premium options. AC Direct LED Linear Tubes feature an integral driver allowing the lamp to bypass the ballast, providing the highest linear tube efficacy, up to 150 lm/W, as there are no ballast losses. Universal’s unique double ended power connection simplifies installation, eliminates hazards that are found in single end powered tubes and uses existing lamp holders that are either shunted or non-shunted. All Universal LED Linear Tubes provide ease of installation, immediate energy savings of 30% or more, and low maintenance (because of their long life, with a 50,000+ hour lifetime at L70). Featuring a seamless glass design and a wide 240º light distribution, they will meet a variety of application needs. The tubes are mercury free and RoHS compliant. EVERLINE LED AC Direct (Type B) Tubes are available in T8, T8 PET Coated (to prevent glass breakage) and T5HO.